Britain, the United States, the Soviet Union and China were the "Big Four" Allied powers, who called themselves "The United Nations". They were joined by numerous other countries, such as Canada, and other Commonwealth countries, as well as governments in exile, such as the Free France and the Netherlands. The Yalta Conference met in the Crimea 4–11 February 1945. It focused on postwar plans for European boundaries. The Soviets already controlled Poland. The new boundaries of Poland were especially important, with Stalin seeking control of western Belorussia and western Ukraine. Poland was to gain parts of Germany. Stalin promised free elections in Poland under the auspices of a government he controlled. At Roosevelt's strong urging, Stalin agreed to enter the war against Japan three months after the defeat of Germany. It was agreed the USSR would be a member of the United Nations Security Council, with a veto, and Ukraine and Belorussia would be UN members, but not the other 12 Soviet republics. Germany was to be divided into three zones of occupation, and France was also to get a zone. In a decision that became highly controversial, all civilians would be repatriated. 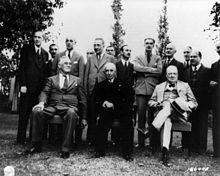 The Potsdam Conference was held from 17 July to 2 August 1945, at Potsdam, Germany, near Berlin. Stalin met with the new U.S. President Harry S. Truman and two British prime ministers in succession—Winston Churchill and Clement Attlee. It demanded "unconditional surrender" from Japan, and finalized arrangements for Germany to be occupied and controlled by the Allied Control Commission. The status of other occupied countries was discussed in line with the basic agreements made earlier at Yalta. The Dumbarton Oaks Conference or, more formally, the Washington Conversations on International Peace and Security Organization was an international conference at which the United Nations was formulated and negotiated among international leaders. The conference was held at Dumbarton Oaks from 21 August 1944 to 7 October 1944. At the conference, delegations from the Soviet Union, the United Kingdom, the United States and the Republic of China deliberated over proposals for the establishment of an organization to maintain peace and security in the world. In spring 1939 both Britain and France formally announced they would defend the integrity of Poland. Hitler did not believe they would fight in such a faraway hopeless cause, and he invaded Poland on September 1, 1939. Britain and France declared war on September 3, 1939. But there was little they could or did do to help Poland. The USSR launched the Winter War against Finland in November 1939. The Finns made a remarkable defense against the much larger Soviet forces. The unprovoked invasion excited widespread outrage at popular and elite levels in support of Finland not only in wartime Britain and France but also in neutral United States. The League of Nations declared the USSR was the aggressor and expelled it. "American opinion makers treated the attack on Finland as dastardly aggression worthy of daily headlines, which thereafter exacerbated attitudes toward Russia." Elite opinion in Britain and France swung in favor of military intervention. 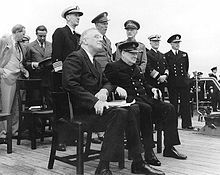 Winston Churchill, as head of the Royal Navy, and French Premier Paul Reynaud were the chief advocates. It came when there was a military stalemate on the continent called the "Phony War". Months of planning at the highest civilian, military and diplomatic levels in London and Paris, saw multiple reversals and deep divisions. Finally the British and French agreed on a plan that involved uninvited invasions of neutral Norway, Sweden, Iceland, and Denmark's Faroe Islands, with the goals chiefly of damaging the German war economy and also assisting Finland in its war with the Soviet Union. An allied war against the Soviet Union was part of the plan. The actual Allied goal was not to help Finland but to engage in economic warfare against Germany by cutting off shipments of Swedish iron ore, which they calculated would seriously weaken German war industry. The British Ministry of Economic Warfare stated that the project against Norway would be likely to cause "An extremely serious repercussion on German industrial output...and would in any case have a profound effect on the duration of the war." The idea was to shift forces away from doing little on the static Western front into an active role on a new front. The British military leadership by December became enthusiastic supporters when they realized that their first choice, an attack on German oil supplies, would not get approval but this plan would win strong support. The poor performance of the Soviet army against the Finns strengthened the confidence of the Allies that the invasion, and the resulting war with Russia, would be worthwhile. However the civilian leadership of Neville Chamberlain's government in London drew back and postponed invasion plans. The neutrals refused to cooperate. Meanwhile, Finland was overwhelmed and gave in to Moscow on 13 March 1940 and the plan was postponed. War plans against the USSR were dropped and the new goal was to mine the Norwegian coast to prevent the passage of ships carrying iron ore from northern Norway. There were more delays and when mining operations finally started on 9 April it was too late—the Germans hours before had invaded Norway and had the upper hand in the Norwegian Campaign. When Germany began its attack on France in April 1940, British troops and French troops again fought side by side, but defeat came quickly. The Royal Navy evacuated 198,000 British and 140,000 French soldiers in the Dunkirk evacuation in late May/early June 1940. Tens of thousands of tanks, trucks and artillery guns were left behind, as well as all of the radios, machine guns, rifles, tents, spare parts and other gear. The new Prime Minister Winston Churchill pledged that Britain would continue to fight for France's freedom, even if it must do so alone. After Mers el Kebir, Britain recognised Free France as its ally and the legitimate government of France. 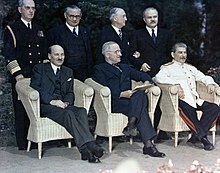 In October 1944 Churchill and his Foreign Minister Anthony Eden met in Moscow with Stalin and his foreign minister Molotov. They planned who would control what in postwar Eastern Europe. They agreed to give 90% of the influence in Greece to Britain and 90% in Romania to USSR. USSR gained an 80%/20% division in Bulgaria and Hungary. There was a 50/50 division in Yugoslavia, and no Soviet share in Italy. 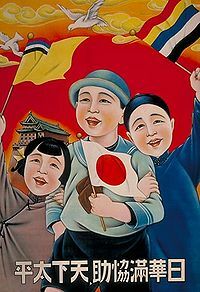 In 1931 Japan took advantage of China's very weak central government in the Warlord Era and fabricated the Mukden Incident in 1931 to set up the puppet state of Manchukuo in Manchuria. Puyi, who had been the last emperor of China, became "emperor" of China again; he was a Japanese puppet. In 1937 the Marco Polo Bridge Incident triggered the Second Sino-Japanese War. The invasion was launched by the bombing of many cities such as Shanghai, Nanjing and Guangzhou. The latest, which began on 22 and 23 September 1937, called forth widespread protests culminating in a resolution by the Far Eastern Advisory Committee of the League of Nations. The Imperial Japanese Army captured the Chinese capital city of Nanjing, and committed war crimes in the Nanjing massacre. The war tied down large numbers of Chinese soldiers, so Japan set up three different Chinese puppet states to enlist some Chinese support. After World War II ended in 1945, the showdown came between the Nationalists and the Communists in a full-scale civil war. American general George C. Marshall tried to broker a truce but he failed. The Kuomintang (Nationalist) military position steadily worsened and by 1949, the Communists were victorious and drove the Nationalists from the mainland onto the island of Taiwan and other islands. Mao Zedong established the People's Republic of China (PRC) in mainland China, while the Republic of China remains in Taiwan to this day. After he ignored repeated warnings, Stalin was stunned when Hitler invaded in June 1941. Stalin eventually came to terms with Britain and the United States, cemented through a series of summit meetings. The U.S. and Britain supplied war materials through Lend Lease. There was some coordination of military action, especially in summer 1944. At war's end it was doubtful whether Stalin would allow free elections in eastern Europe. The central diplomatic issue was future of Allies, and as it turned out this Soviet-Western alliance was not a permanent one. Paris fell to the Germans on 14 June 1940, and the government surrendered in the Armistice of 22 June 1940 with new new leader Marshal Philippe Pétain (1856-1961). His Vichy regime was authoritarian, Catholic, paternal and anti-Semitic. His charisma and popularity from his heroic role in the First World War strengthened his authority, although he was increasingly too old to pay attention to details. After Germany seized all of Vichy in October 1942, it installed Pierre Laval as its puppet leaving Pétain as a helpless figurehead. The armistice included numerous provisions that weakened France, all largely guaranteed by the German policy of keeping 2 million French prisoners of war and workers in Germany as hostages. Vichy France was nominally a neutral country. it never declared war on the Soviet Union or Britain, and was recognized diplomatically by the United States until 1942. Although Vichy France was nominally in control of all of France—apart from Alsace Lorraine—in practice the Germans controlled three-fifths of the country, including the northern and western coasts, the industrial northeast, and the Paris region. The Petain government relocated to the resort town of in Vichy and controlled the rest From the start, Germany wanted food, minerals, and industrial productions, as well as volunteers to work in German factories. Vichy was allowed to control its foreign colonies—to the extent it could defend them against the Free French—as well as its fleet, to the extent it could defend it against British naval attacks. In October 1942, Germany took it all over; the Vichy regime became entirely a puppet of the German occupiers. Marshal Pétain, left, head of Vichy France, shaking hands with Hitler on October 24, 1940. The small town of Montoire-sur-le-Loir was the scene of two meetings. On October 22, 1940, Pierre Laval met with Hitler to set up a meeting on October 24 between Hitler and Pétain. It ended in a much-publicized handshake between the two, but in fact their discussions had been entirely general and no decisions had been made. Hitler was impressed with Petain's commitment to defending the French Empire. False rumours abounded that France had made major concessions regarding colonies and German control of French ports and the French feet. Germany controlled the entire French economy, and demanded huge reparations in gold and food. However nearly 2 million French soldiers became prisoners of war in Germany. They served as hostages and forced laborers in German factories. Vichy was intensely conservative and anti-Communist, but it was practically helpless. Vichy finally collapsed when the Germans fled in summer 1944. The United States granted Vichy full diplomatic recognition, sending Admiral William D. Leahy to Paris as American ambassador. President Roosevelt hoped to use American influence to encourage those elements in the Vichy government opposed to military collaboration with Germany. Vichy still controlled its overseas colonies and Washington encouraged Vichy to resist German demands such as for air bases in Syria or to move war supplies through French North Africa. The essential American position was that France should take no action not explicitly required by the armistice terms that could adversely affect Allied efforts in the war. When Germany took full control, the U.S. and Canada cut their ties with Vichy. by 1942, Germany was demanding that Vichy turnover the Jews for deportation to German concentration camps. Reluctantly at first, then more enthusiastically, Vichy complied. They turned over 80,000 of the 330,000 French and foreign Jews living in Vichy; the Germans killed 77,000. When Germany tried to seize the French fleet at Toulon in November, 1942, the French navy scuttled all its ships. Britain feared that the powerful French navy could end up in German hands and be used against its own naval forces, which were so vital to maintaining north Atlantic shipping and communications. Under the armistice, France had been allowed to retain the French Navy, the Marine Nationale, under strict conditions. Vichy pledged that the fleet would never fall into the hands of Germany, but refused to send the fleet beyond Germany's reach by sending it to Britain or to far away territories of the French empire such as the West Indies. Shortly after France gave up it attacked a large French naval contingent in Mers-el-Kebir, killing 1,297 French military personnel. Vichy severed diplomatic relations but did not declare war on Britain. Churchill also ordered French ships in British ports to be seized by the Royal Navy. The French squadron at Alexandria, Egypt, under Admiral René-Emile Godfroy, was effectively interned until 1943. Free France was the insurgent French government based in London and the overseas French colonies and led by charismatic general Charles de Gaulle. De Gaulle had been a Secretary of state in the last consistutional government in the French Third Republic. From London on 18 June 1940 he gave an impassioned radio address exhorting the patriotic French people to resist Nazi Germany He organized the Free French Forces from soldiers that had escaped with the British at Dunkirk. 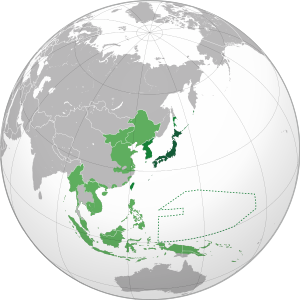 With British military support the Free French gradually gained control of all French colonies except Indochina, which the Japanese controlled. The U.S., Britain and Canada wanted Vichy to keep nominal control of the small islands of St. Pierre and Miquelon for reasons of prestige, but de Gaulle seized them anyway in late 1941. The U.S. believed, falsely, that Germany had a master plan to subvert and take control of the economy of much of South America. Washington made anti-Nazi activity a high priority in the region. By July 1941, President Franklin Delano Roosevelt authorized the creation of the Office of the Coordinator of Inter-American Affairs (OCIAA) in response to perceived propaganda efforts in Latin America by Germany and Italy. Through the use of news, film and radio broadcast media in the United States, Roosevelt sought to enhance his Good Neighbor policy, promote Pan-Americanism and forestall military hostility in Latin America through the use of cultural diplomacy. Three countries actively joined the war effort, while others passively broke relations or nominally declared war. Cuba declared war in December 1941 and actively helped in the defense of the Panama Canal. It did not send forces to Europe. Mexico declared war on Germany in 1942 after u-boats sank Mexican tankers carrying crude oil to the United States. It sent a 300-man fighter squadron to the war against Japan in 1945. Brazil declared war against Germany and Italy on 22 August 1942 and sent a 25,700-man infantry force that fought mainly on the Italian front, from September 1944 to May 1945. Its Navy and Air Force acted in the Atlantic Ocean. Despite declaring neutrality the Baltic states were secretly assigned to the Soviet Sphere of influence via the Molotov–Ribbentrop pact and subsequently occupied by the Soviet Union and Nazi Germany. Diplomatic legations continued to represent the Baltic states throughout the period. The United States never recognized control by Germans or USSR. Portugal controlled strategically vital Azores islands in the Atlantic, and Britain and the U.S. made plans called Operation Alacrity to invade them if necessary. Portugal although it had an alliance with Britain was officially neutral; its highest goal was to avoid a German invasion. Its dictator Salazar collaborated with the British and sold them rubber and tungsten ("wolfram"). In late 1943 he allowed the Allies to establish air bases in the Azores to fight U-boats. He helped Spain avoid German control. Tungsten was a major product, and he sold to Germany; he stopped in June 1944, when the threat of a German invasion of Portugal was no longer possible. He worked to regain control of East Timor after the Japanese seized it. He admitted several thousand Jewish refugees. Lisbon maintained air connections with Britain and the U.S. Lisbon was a hotbed of spies and served as the base for the International Red Cross in its distribution of relief supplies to POWs held by Germany. The Quakers and other peace groups used it as a base for their aid to refugees. At the outbreak of war between Germany and Poland, Britain and France in September 1939, Sweden declared neutrality. At outbreak of war in November between Finland and the Soviet Union, Sweden declared "Non-belligerent" to make it possible to support Finland with arms and Volunteers in the Winter War. From 13 December to the end of the war, a National unity government under Prime Minister Per Albin Hansson and Foreign Minister Christian Günther was formed that included all major parties in the Riksdag. From April 1940 Sweden and Finland was encircled between the Nazi Germany and the Soviet union and subject to both British and German blockades. In spring-summer 1940 the United States stopped delivery of fighter aircraft to Sweden. Sweden made concessions to both Allies and Germany. It held that that neutrality and cooperation with Germany were necessary for survival, for Germany was vastly more powerful, concessions were limited and were only made where the threat was too great; neutrality was bent but not broken; national unity was paramount; and in any case Sweden had the neutral right to trade with Germany. Germany needed Swedish iron and had nothing to gain—and much iron to lose—by an invasion. As a free country, refugees from Finland, Norway, Denmark and the Baltic states fled to Sweden during the war. During the last part of the war, it was possible to save some victims from German concentration camps. Of all the neutrals, Switzerland has the great right to distinction. She has been the sole international force linking the hideous-sundered nations and ourselves. What does it matter whether she has been able to give us the commercial advantages we desire or has given too many to the German, to keep herself alive? She has been a democratic state, standing for freedom in self defence among her mountains, and in thought, despite of race, largely on our side. Hitler devoted most of his attention during the war to military and diplomatic affairs. He frequently met with foreign leaders, such as the January 10, 1943 he met with Romanian Premier Marshal Ion Antonescu at German field headquarters, with top-ranking generals on both sides. On 9 August 1943, Hitler summoned Tsar Boris III of Bulgaria to a stormy meeting at field headquarters, and demanded he declare war on Russia. The tsar refused, but did agree to declare war on far-away Britain. American news reports stated that Hitler tried to hit him and the tsar suffered a heart attack at the meeting; he died three weeks later. German policy was not to use or build factories in occupied Eastern Europe but to move millions of workers into German factories and farms. Some were forced, some went voluntarily (going in search of food), and others were prisoners of war. They were closely watched, had poor food and housing, and were harshly treated. Their morale and levels of output were mediocre or poor. At the peak the forced labourers comprised 20% of the German work force. Counting deaths and turnover, about 15 million individuals were forced labourers at one point or another during the war. Most came from Poland, Russia and other Eastern areas; all were repatriated at war's end. Vichy France was one of the few countries that was able to have much influence on German policies, as it tried to protect the nearly two million French soldiers held as POWs inside Germany. Vichy arranged a deal whereby Germany would release one POW for every three Frenchmen who volunteered to work in Germany. Before coming to power Hitler on his part denounced the right of Poland to independence writing that Poles and Czechs are a "rabble not worth a penny more than the inhabitants of Sudan or India. How can they demand the rights of independent states? ", and demanding a new partition of Poland with nationalist Russia. Referring to the restoration of the Polish state, Hitler stated "the creation of the Polish state was the greatest crime ever committed against the German nation". In January 1934 Germany signed a non aggression pact with Poland followed by trade later in the year, while secretly organizing preparations in the following years for invasion of Poland and mass murder of Polish population By the spring Hitler was openly pondering what inducements he might have to offer to obtain a military alliance with Poland. Between 1919 and 1939 Poland pursued a policy of balance between Soviet Union and Nazi Germany and obtained non-aggression treaties with the former. ... a mortgage on Polish foreign policy, while itself retaining complete liberty of action allowing the conclusion of political agreements with other countries. In these circumstances, the new settlement proposed by Germany, which would link the questions of Danzig and of the passage across the Corridor with counterbalancing questions of a political nature, would only serve to aggravate this mortgage and practically subordinate Poland to the Axis and the Anti-Comintern Bloc. Warsaw refused this in order to retain its independence. By March Hitler had given up on the Poles and in April began planning an invasion. Hitler's offers are described by Max Domarus as an attempt to buy time before going against Poland. Italy was poorly prepared for war and increasingly fell under Nazi dictation. After initial success in British Somaliland, Egypt, the Balkans (despite the initial defeat against Greece), and eastern fronts, Italian military efforts failed in North and East Africa, and Germany had to intervene to rescue its neighbor. After the Allies invaded and took Sicily and southern Italy in 1943, the regime collapsed. Mussolini was arrested and the King appointed General Pietro Badoglio as new Prime Minister. They later signed the armistice of Cassibile and banned the Fascist Party. However Germany moved in, with the Fascists' help, occupying Italy north of Naples. German paratroopers rescued Mussolini and Hitler set him up as head of a puppet government the Italian Social Republic, often called the Salò Republic; a civil war resulted. The Germans gave way slowly, for mountainous Italy offered many defensive opportunities. Hitler, preparing to invade the Soviet Union, diverted attention to make sure the southern or Balkan flank was secure. Romania was under heavy pressure, and was forced to cede 40,000 square miles of territory with 4 million people to the USSR, Hungary and Bulgaria; German troops came in to protect the vital oil fields (Germany's only source of oil besides the USSR). Romania signed the Axis Pact and became a German ally (November 1940). So too did Hungary (November 1940) and Bulgaria (March, 1941). In spring 1939, Italy occupied and annexed Albania. Britain tried to deter an invasion by guaranteeing Greece's frontiers. Greece, under the dictatorship of Ioannis Metaxas, to support the Allies' interests rejected Italian demands. Italy invaded Greece on 28 October 1940, but Greeks repelled the invaders after a bitter struggle (see Greco-Italian War). By mid-December, 1940, the Greeks occupied nearly a quarter of Albania, tying down 530,000 Italian troops. Metaxas tended to favor Germany but after he died in January 1941 Greece accepted British troops and supplies. In March 1941, a major Italian counterattack failed, humiliating Italian military pretensions. Yugoslavia signed on as a German ally in March 1941, but within days an anti-Nazi coup, led by Serbians with British help, overthrew the prince regent, repudiated the Nazis, and installed the 17-year-old heir as King Peter II. Germany immediately bombarded the capital Belgrade and invaded in force on April 6. Within days the Germans were in full control; the new king fled as did many party leaders. However some prominent politicians supported the Germans, and others were passive. The German invasion set off an extremely bloody, long civil war that killed over a million people. Germany dismembered Yugoslavia, with slices going to Germany and Italy. Kosovo was given to Albania (then under Italian control). Macedonia went to Bulgaria and Vojvodina was given over to Hungary. Serbia became a German puppet state and was the cockpit of the resistance. In Slovenia, Germans deported Slovenes to Serbia, enrolled them in the German army, or deported them to Germany to work in war factories and labor camps. In Serbia the Germans set up General Milan Nedić in charge of a "government of national salvation" but did not permit it to maintain a regular army or foreign affairs ministry. What was left of Yugoslavia became the new Independent State of Croatia (NDH) under the rule of Ante Pavelić and his fascist Ustashe party. It became an Axis ally and controlled Croatia, Bosnia and Herzegovina. The Ustaše murdered around 90,000 people (mostly Serbs, along with 37,000 Jews), expelled 250,000, and forced another 200,000 to convert to Catholicism. Two major anti-German anti-fascist guerrilla movements emerged, the first in Europe self-organised anti-fascist movement (started in Croatia) partisans led by a Croat Josip Broz Tito had the initial support from the Kremlin. The Chetniks led by the Serbian chetnik Colonel Draža Mihailović was loyal to the royal government in exile based in London. Tito's movement won out in 1945, executed its enemies, and reunited Yugoslavia. The attack on Pearl Harbor initially appeared to be a major success that knocked out the American battle fleet—but it missed the aircraft carriers that were at sea and ignored vital shore facilities whose destruction could have crippled US Pacific operations. Ultimately, the attack proved a long-term strategic disaster that actually inflicted relatively little significant long-term damage while provoking the United States to seek revenge in an all-out total war in which no terms short of unconditional surrender would be entertained. However, as Admiral Yamamoto warned, Japan's six-month window of military advantage following Pearl Harbor ended with the Japanese Navy's offensive ability being crippled at the hands of the American Navy in the Battle of Midway. As the war became one of mass production and logistics, the U.S. built a far stronger navy with more numerous warplanes, and a superior communications and logistics system. The Japanese had stretched too far and were unable to supply their forward bases—many soldiers died of starvation. Japan built warplanes in large quantity but the quality plunged, and the performance of poorly trained pilots spiraled downward. The Imperial Navy lost a series of major battles, from Midway (1942) to the Philippine Sea (1944) and Leyte Gulf (1945), which put American long-range B-29 bombers in range. A series of massive raids burned out much of Tokyo and 64 major industrial cities beginning in March 1945 while Operation Starvation seriously disrupted the nation's vital internal shipping lanes. Regardless of how the war was becoming hopeless, the circle around the Emperor held fast and refused to open negotiations. Finally in August, two atomic bombs and the Soviet invasion of Manchuria demonstrated the cause was futile, and Hirohito authorized a surrender whereby he kept his throne with his powers taken away. Finland fought two major wars against the USSR: the Winter War after the USSR invaded, of 1940–41 and the Continuation War of 1941–44, in which Finland teamed with Germany in seeking revenge. It lost both. It fought one small one, the Lapland War to successfully drive German forces out of Lapland in 1944–45. The August 1939 Molotov–Ribbentrop Pact between Germany and the Soviet Union contained a secret protocol dividing much of eastern Europe and assigning Finland to the Soviet sphere of influence. Finland before 1918 had been a province of Russia, and many Finnish speakers lived in neighboring parts of Russia. After unsuccessfully attempting to force territorial and other concessions on the Finns, the Soviet Union invaded Finland in November 1939 starting the Winter War. Finland won very wide popular support in Britain and the United States. After the Winter War, Finland sought protection and support from the Britain and Sweden without success. Finland drew closer to Germany, first with the intent of enlisting German support as a counterweight to thwart continuing Soviet pressure, and later to help regain lost territories. Finland declared war against the Soviet Union on 25 June 1941 in what is called the Continuation War. To meet Stalin's demands, Britain reluctantly declared war on Finland on 6 December 1941, although no other military operations followed. War was never declared between Finland and the United States, though relations were severed between the two countries in 1944 as a result of the Ryti–Ribbentrop Agreement. The arms-length collaboration with Germany stemmed from a precarious balance struck by the Finns in order to avoid antagonizing Britain and the United States. In the end Britain declared war to satisfy the needs of its Soviet policy, but did not engage in combat against Finland. Finland concluded armistice negotiations with the USSR under strong German pressure to continue the war, while British and American acted in accord with their own alliances with the Soviets. After Soviet offensives were fought to a standstill, in 1944 Ryti's successor as president, Marshall Mannerheim, opened negotiations with the Soviets, which resulted in the Moscow Armistice on 19 September 1944. Under its terms Finland was obliged to expel German troops from Finnish territory, which resulted in the Lapland War. Finland signed a peace treaty with the Allied powers in 1947. When the Polish forces were demolished by Germany in the first three weeks of September 1939, the government vanished and most Polish leaders fled to Romania, where they were interred. 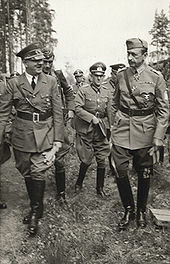 Other leaders escaped to France, and later to London, where the Polish government-in-exile was set up by General Sikorski. It was recognized by the Allies until 1944. Since the start of the war the body protested on the international stage against the German occupation of their territory and the treatment of their civilian population. In 1940 the Polish Ministry of Information produced a list of those it believed had been murdered by the Nazis. On 10 December 1942, the Polish government-in-exile published a 16-page report addressed to the Allied governments, titled The Mass Extermination of Jews in German Occupied Poland. 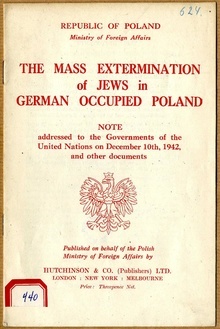 [a] The report contained eight pages of Raczyński's Note, which was sent to foreign ministers of 26 governments who signed the Declaration by United Nations on 1 January 1942. Yugoslavia had a weak government in exile based in London that included King Peter. However, power inside the country was divided three ways between the Germans and their allies, and two Serbian resistance groups. The royalist anti-Communist Chetniks under Draža Mihailović, was nominally under the control of the government in exile. Chetniks were Serbians opposed to the Nazis but sometimes did collaborate with the Germans and Ustaša in their fierce guerrilla battles with the National Liberation Army, a Communist-controlled resistance headed by Josip Broz Tito. Tito's strength grew in 1943, and Mihailović and the monarchists fell far behind. Churchill reversed course in December 1943, ended his support for the forces of Mihailović, and backed instead Tito. The government in exile followed suite and supported Tito. Tito drove out the Germans in 1945, repudiated the government in exile, liquidated the Mihailovic forces. This allowed the formation of a Communist state of Yugoslavia that was independent of Moscow, with Tito in full control. ^ See: Polish Ministry of Foreign Affairs (10 December 1942), The Mass Extermination of Jews in German Occupied Poland. Note to the Governments of the United Nations. ^ Heiferman, Ronald Ian (2011). 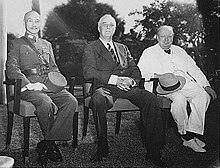 The Cairo Conference of 1943: Roosevelt, Churchill, Chiang Kai-shek and Madame Chiang. Jefferson, NC: McFarland & Company. ^ Fraser J. Harbutt, Yalta 1945: Europe and America at the Crossroads (2010). ^ Herbert Feis, Between War and Peace: The Potsdam Conference (1960). ^ "1945: The San Francisco Conference". United Nations. Retrieved 24 April 2015. ^ Leo T. Crowley, "Lend Lease" in Walter Yust, ed. 10 Eventful Years (1947)1:520, 2, pp. 858–60. There had been loans before Lend lease was enacted; these were repaid. ^ Alan Warren (2006). Britain's Greatest Defeat: Singapore 1942. Continuum. p. 295. ISBN 9781852855970. ^ Arthur Herman (2008). Gandhi & Churchill: The Epic Rivalry That Destroyed an Empire and Forged Our Age. Random House Digital, Inc. pp. 472–539. ISBN 9780553804638. ^ Gordon F. Sander, The Hundred Day Winter War (2013) pp 4-5. ^ Ralph B. Levering (2017). American Opinion and the Russian Alliance, 1939-1945. p. 210. ISBN 9781469640143. ^ Bernard Kelly, "Drifting Towards War: The British Chiefs of Staff, the USSR and the Winter War, November 1939–March 1940." Contemporary British History 23.3 (2009): 267-291. ^ Erin Redihan, "Neville Chamberlain and Norway: The Trouble with 'A Man of Peace' in a Time of War." New England Journal of History (2013) 69#1/2 pp 1-18. ^ a b David G. Haglund, "Roosevelt as 'Friend of France'—But Which One?." Diplomatic history (2007) 31#5 pp: 883-908. ^ Robert Lyman (2006). Iraq 1941: The Battles For Basra, Habbaniya, Fallujah and Baghdad. Osprey Publishing. pp. 12–17. ISBN 9781841769912. ^ Kenneth Morgan (2012). Australia: A Very Short Introduction. Oxford U.P. p. 90. ISBN 9780199589937. ^ Peter Dean (2013). Australia 1943: The Liberation of New Guinea. Cambridge UP. pp. 26–43. ISBN 9781107470880. ^ Robert A. Pastor (1999). A Century's Journey: How the Great Powers Shape the World. Basic Books. p. 218ff. ISBN 9780465054763. ^ William E. Leuchtenburg (2015). In the Shadow of FDR: From Harry Truman to Barack Obama. Cornell UP. p. 314. ISBN 9780801462573. ^ Torbjørn L. Knutsen (1999). The Rise and Fall of World Orders. Manchester UP. p. 184ff. ISBN 9780719040580. ^ See Laura Tyson Li, Madame Chiang Kai-Shek: China's Eternal First Lady (New York: Atlantic Monthly Press, 2006). ^ John Erickson (2013). The Soviet High Command: a Military-political History, 1918-1941: A Military Political History, 1918-1941. Routledge. pp. 525–30. ISBN 9781136339523. ^ Anna M. Cienciala et al. eds. Katyn: A Crime Without Punishment (Yale University Press, 2008). ^ Marc Olivier Baruch, "Charisma and Hybrid Legitimacy in Pétain’s État français (1940‐44)." Totalitarian Movements and Political Religions 7.2 (2006): 215-224. ^ William L. Langer, Our Vichy Gamble (1947) pp 89-98. ^ David Mayers (2012). FDR's Ambassadors and the Diplomacy of Crisis: From the Rise of Hitler to the End of World War II. Cambridge U.P. p. 160. ISBN 9781107031265. ^ Arthur L. Funk, "Negotiating the 'Deal with Darlan,'" Journal of Contemporary History (1973) 8#1 pp 81–117 in JSTOR. ^ Berthon, Simon (2001). Allies at War: Allies at War: The Bitter Rivalry among Churchill, Roosevelt, and de Gaulle. London: Collins. p. 21. ISBN 978-0-00-711622-5. ^ Neville Wylie, European Neutrals and Non-Belligerents During the Second World War (2002). ^ Frank D. McCann, "Brazil, the United States, and World War II," Diplomatic History (1979) 3#1 pp 59–76. ^ Donald G. Stevens, "World War II Economic Warfare: The United States, Britain, and Portuguese Wolfram." Historian 61.3 (1999): 539-556. ^ Sonny B. Davis, "Salazar, Timor, and Portuguese Neutrality in World War II," Portuguese Studies Review (2005) 13#1 pp 449–476. ^ William Howard Wriggins, Picking up the Pieces from Portugal to Palestine: Quaker Refugee Relief in World War II (2004). ^ William Z. Slany (1997). US and Allied Efforts to Recover and Restore Gold and Other Assets Stolen Or Hidden by Germany During World War II. DIANE Publishing. p. 100. ISBN 9780788145360. ^ Georg Kreis (2013). Switzerland and the Second World War. Routledge. pp. 132–33. ISBN 9781136756702. ^ Neville Wylie (2003). Britain, Switzerland, and the Second World War. Oxford U.P. p. 2. ISBN 9780198206903. ^ Christian Leitz (2000). Nazi Germany and neutral Europe: during the Second World War. Manchester U.P. p. 175. ISBN 9780719050695. ^ Bernd Martin (2005). Japan and Germany in the Modern World. Berghahn Books. pp. 279–80. ISBN 9781845450472. ^ Adam Tooze, The Wages of Destruction (2007) pp. 476–85, 538–49. ^ Michael Curtis (2002). Verdict on Vichy: Power and Prejudice in the Vichy France Regime. Skyhorse. p. 141. ISBN 9781611456479. ^ Stutthof: hitlerowski obóz koncentracyjny Konrad Ciechanowski Wydawnictwo Interpress 1988, page 13"
^ Zara Steiner (2011). The Triumph of the Dark:European International History 1933–1939. Oxford University Press. pp. 690–92. ISBN 9780191613555. ^ Prażmowska, Anita J. (2004-02-12). Britain, Poland and the Eastern ... - Google Books. ISBN 978-0-521-52938-9. Retrieved 2009-06-16. ^ Ian Kershaw (2001). 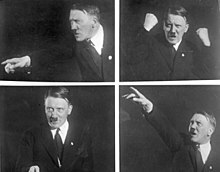 Hitler, 1936–1945: Nemesis. W W Norton. p. 190. ISBN 9780393322521. ^ Donald Cameron Watt (1989). How war came: the immediate origins of the Second World War, 1938–1939. ISBN 9780434842162. ^ Mark Mazower, Inside Hitler's Greece: The Experience of Occupation, 1941-44 (2001). ^ John R. Lampe, Yugoslavia as History: Twice There Was a Country (2nd ed. 2000) pp 201-232. ^ Tomislav Dulić, "Mass killing in the Independent State of Croatia, 1941–1945: a case for comparative research." Journal of Genocide Research 8.3 (2006): 255-281. ^ "Croatia" (PDF). Shoah Resource Center – Yad Vashem. Retrieved 23 June 2013. ^ Paul Bookbinder, "A Bloody Tradition: Ethnic Cleansing in World War II Yugoslavia." New England Journal of Public Policy 19#2 (2005): 8+ online. ^ Walter R. Roberts, Tito, Mihailović, and the allies, 1941-1945 (1987). ^ Vehviläinen, Olli (2002). Finland in the Second World War. Palgrave-Macmillan. ^ Mauno Jokipii. "Finland's Entrance into the Continuation War," Revue Internationale d'Histoire Militaire (1982), Issue 53, pp 85–103. ^ Tuomo Polvinen, "The Great Powers and Finland 1941–1944," Revue Internationale d'Histoire Militaire (1985), Issue 62, pp 133–152. ^ Chris Mann and Christer Jörgensen (2003). Hitler's Arctic War: The German Campaigns in Norway, Finland, and the USSR 1940–1945. St. Martin's Press. p. 69. ISBN 9780312311001. ^ Jerzy Lukowski and Hubert Zawadzki, A Concise History of Poland (2006) pp. 264–265. ^ Jonathan E. Helmreich (1998). United States Relations with Belgium and the Congo, 1940–1960. U. of Delaware Press. pp. 43–55. ISBN 9780874136531. ^ Willian L Shirer, "Rise and Fall of the third Reich"
Woodward, Llewelyn. "The Diplomatic History of the Second World War" in C. L. Mowat, ed. The New Cambridge Modern History: Vol. XII: The Shifting Balance of World Forces 1898-1945 (2nd ed. 1968) online free pp 798–818. Toynbee, Arnold, ed. Survey Of International Affairs: Hitler's Europe 1939-1946 (1954) online; 760pp; Highly detailed coverage of Germany, Italy and conquered territories. Andrew, Christopher M. Defend the Realm: The Authorized History of MI5 (2009). Breuer, William B. The Secret War with Germany: Deception, Espionage, and Dirty Tricks, 1939-1945 (Presidio Press, 1988). Drea, Edward J. MacArthur's ULTRA: Codebreaking and the War against Japan, 1942-1945 (1992). Katz, Barry M. Foreign intelligence: Research and analysis in the Office of Strategic Services, 1942-1945 (1989). U.S.A.
Stephan, Robert W. Stalin's secret war: Soviet counterintelligence against the Nazis, 1941-1945 (2004). Waller, Douglas. Wild Bill Donovan: The spymaster who created the OSS and modern American espionage (2011). Wohlstetter, Roberta. Pearl Harbor: warning and decision (1962) excerpt.